I have a big hand when it comes to cooking. So I always store leftovers! Sometimes I just reheat those and eat and sometimes when I am bored of eating those again either throw away (I know waste of food!) or just think of some crazy creations with those leftovers. But trust me, my family always show thumbs up for these yummy creations. After I made Idli Fritters with leftover idlis, I wanted to try a different recipe with them. So this variety vada has occurred to my mind. Soak moong dal for 3 hrs and grind into a fine paste using little water along with red chilies, ginger and cumin seeds. Don’t make it too watery. Crush idlis coarsely with hand and add this to the moong dal batter and mix well. Add onions + cilantro and salt to the batter and mix well. If the batter turns too watery add some rice flour and mix well. The batter should be thick so it would be easy to make round shapes for vadas. In a deep pan add oil and heat. Then take small portions of batter, shape into a circle and carefully drop into the hot oil. Fry till the vadas turn golden brown in color and take them away from oil and place on a paper towel to drain excess oil. Repeat the same process with remaining batter. 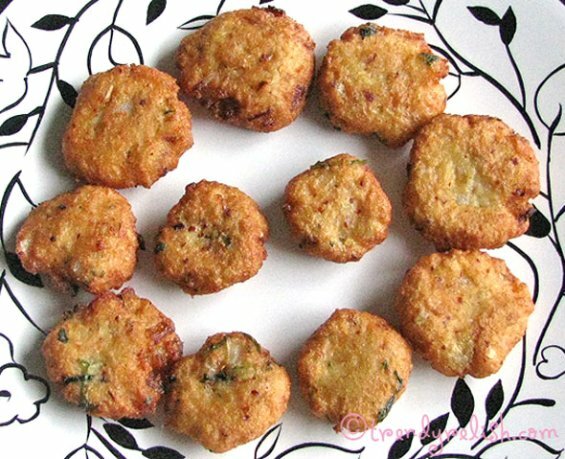 Enjoy these crispy vadas with a cup of coffee/tea. 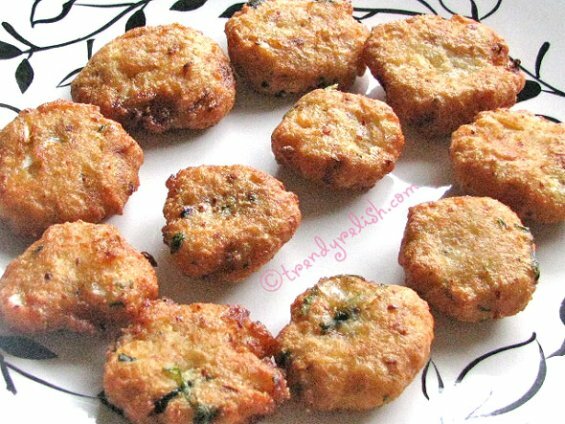 Use any desired chutney as a dip for these vadas. Wow Uma...very innovative and ofcourse yummy! That's one creative dish. How could you have thought of pairing moong dal and left ovre idlis? Great. Happy sankranthi & Happy Pongal Uma. Wow... Uma, You are very innovative.. That looks perfect and delicious! Nice idea! That looks yummy and perfect. You are incredibly creative when it come to make dishes like this. These look like perfect vadas...I'm sure they tasted great too. Happy Sankranthi. U know what i was litteraly searching idlis in ur plate what a great way to incorporate the leftover! Happy Sankranthi to you and Your family! This is a very different vada recipe. Look so good. YUM! Very Innovative Uma..Vada looks very deliocus ..
nice idea of using leftover idlies...great job uma.. This is the best part of your blog... you have such innovative ways of dealing with left overs! Lovely vadas. I have never trid moongdall vada. Using idlis in vadas is also new idea. 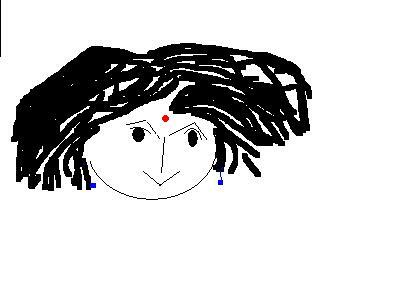 You are very creative, Uma!! Amazing. Wonderful Uma, I have try them. I usually make upma with the left over idlis. My husband and daughter can have idlis any time of the day so it is difficult to have some leftovers. Baavunnayi Uma. 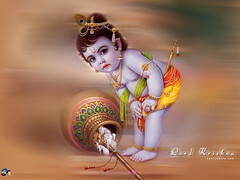 I hope you had a good sankranthi. Cool idea to mix pesara pappu..
How creative! They look so crispy and yum. You are too good and creative with vadas and juices/milkshakes (ofocurse other things also), but this is just too good Uma..
Great idea Uma...can i have some:).Will try this the next time i have idlies at home! That's so creative, Uma! Wishing you a belated Sankranthi and a happy New Year!